In my last productivity tips article we looked at the “It’s Only Principle where we changed the way we thought a task by instead of thinking about how big it seemed, we thought about the small amount of time it really represented. This week’s productivity technique can be used on its own on in conjuction with the “It’s Only Principle” to help propel yourself to to super productivity. What’s this week’s awesome technique? Micro Rewards! We’re used to being told to reward ourselves in various ways: quit smoking and put the money you would have spent on cigarettes in a jar to treat yourself later, loose 2 stone and buy that Chanel dress you’ve always wanted etc. These are great rewards – and very motivating, there’s just one problem with them: Time. Don’t get me wrong – I’m not knocking the effort or the reward, it’s great for long-term goals but doesn’t really suit much shorter projects, or small tasks. What Is A Micro Reward? Instead of waiting weeks or months to reward yourself, you reward yourself regularly for completing smaller tasks. This system works wonders for people who suffer from procrastination or a lack of motivation. A few years ago I got into a rut. I had a couple of problems with my business which left me very unmotivated and depressed. I wouldn’t get out of bed until late in the day, I’d sit and watch T.V all hours of the day and night – I’d do anything except work. I knew I couldn’t go on like this forever, I had no money coming in and my relationship with my family was suffering. I decided I had to do something so that’s when I came up with the idea of rewarding myself for completing smaller tasks. This helped me to get things done I’d been previously ignoring and by starting and finishing tasks it made me feel more motivated and I then became more motivated as a result. 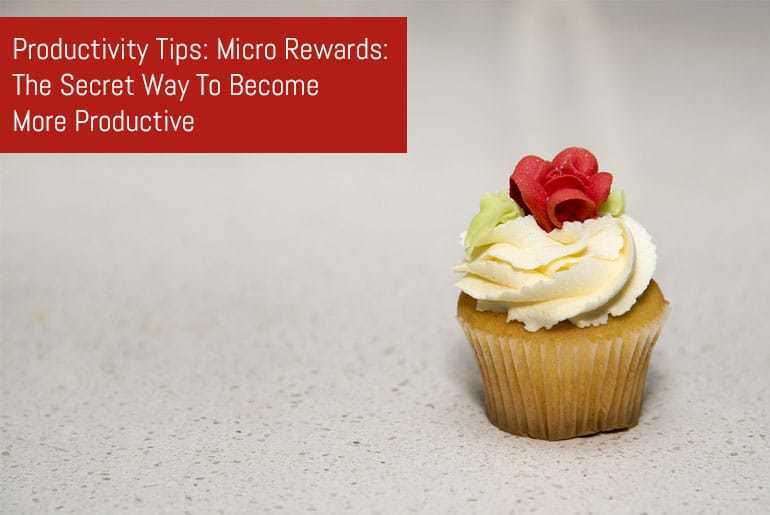 How Does The Micro Reward System Work? Think of a task you’ve been putting off for a while and try to estimate how long it will take you to complete – you don’t need to be super-accurate, you just need a ballpark figure. Now, split that time into segments. How you do this is up to you but for example with an hour long task you might use 15 minute segments or you can use a system like the Pomodoro Technique and for a longer task you might break your task into hourly segments. It doesn’t matter how often the reward chunks are – in fact you could start them at 15 minute intervals and increase them to 30 minutes and then 60 as you feel more motivated, whatever period works for you. You then start your task as normal, except that when you reach the end of your alloted segement time you take your reward. This then motivates you to reach the next segment and so on. What Type Of Rewards Can You Use? The reward you chose may vary depending on the length of the segement you have chosen or perceived difficulty. Rewards can range from a simple sweet, to a beer, to a financial incentive – whatever works for you. As an example of the reward system in action, here’s how I dealt with putting off cleaning my car for too long. I knew it would only take me an hour so I spilt this into two 30 minute segments. I then worked for 30 minutes and then took a break and rewarded myself with a nice cup of tea, I then started the second segment and finished the car in 20 minutes and I rewarded myself with a lovely cold beer! The reward you choose is entirely up to you, you may make it more substantial if the task you are performing is particuarly onerous, or you may make them smaller if you have split your task into a lost of segments, or it’s relatively simple. The important thing is that you must find the reward motivating. You can also also used time-based rewards, for example for every 30 minutes you work you get to watch 10 minutes of your favourite T.V show, computer game etc. – pick whatever your nuggest motivating factor is. Micro Rewards are great because they’re really easy to set up and manage. All you need is a way to measure your time segments and a reward – simple! Micro Rewards are great for short-term tasks: those that can be completed on the same day that they’re started. If the task takes any longer than that then the rewards will need to become bigger to justify the time and effort spent and you will also need to track your progress across multiple days. For these bigger projects the gamification system is ideal. I’ve written in detail about gamification before so I won’t go over it in too much depth but the basics behind it are that you can assign points to tasks and those points unlock levels of rewards. My gamification article includes links to some great apps and trackers for keep your tasks and score up-to-date and you can also download my free gamification tracker below. Click To Gamify Your Day Now! Do you want access to the HUGE Flipping Heck Productivity Library? Simply complete this form and check your inbox for your password to access this download and over 100 More! Do you reward yourself? Does it make you more motivated? If so, what types of rewards to you use? Let us know in the comments below.